In-N-Out Burger has chosen not to franchise its operations or go public; one reason is the prospect of quality or customer consistency being compromised by excessively rapid business growth. The company's business practices have been noted for employee-centered personnel policies. For example, In-N-Out is one of the few fast food chains in the United States to pay its employees more than state and federally mandated minimum wage guidelines – starting at US$11 per hour in California, as of May 2017. The In-N-Out restaurant chain has developed a highly loyal customer base, and has been rated as one of the top fast food restaurants in several customer satisfaction surveys. In-N-Out's first location was opened in the Los Angeles suburb of Baldwin Park, California, in 1948 by the Snyders at the southwest corner of what is now the intersection of Interstate 10 and Francisquito Avenue. The restaurant was the first drive-thru hamburger stand in California, allowing drivers to place orders via a two-way speaker system. This was a new and unique idea, since in post-World War II California, carhops were used to take orders and serve food. The second In-N-Out was on the corner of Azusa Canyon Road and San Bernardino Road, the third was in Pasadena and the fourth was opened west of the intersection of Grand Avenue and Arrow Highway in Covina, California, in the late 1950's. The company remained a relatively small southern California chain until the 1970s. The Snyders managed their first restaurants closely to ensure quality was maintained. The chain had 18 restaurants when Harry Snyder died in 1976, at the age of 63. In 1976, 24-year-old Rich Snyder became the company president after his father's death. Along with his brother Guy, Rich had begun working in his father's In-N-Outs at an early age. Over the next 20 years, the chain experienced a period of rapid growth under Rich's leadership, expanding to 93 restaurants. The first location outside of the Los Angeles metropolitan area was opened in San Diego County in 1990, the 57th location in the chain. In 1992, In-N-Out opened its first non-Southern California restaurant in Las Vegas, Nevada. Its first Northern California location was opened the following year in Modesto. Expansion then spread to Northern California, including the San Francisco Bay Area, while additional Las Vegas-area restaurants were added. However, after opening store 93 In-N-Out in Fresno, California, on December 15, 1993, Rich Snyder and four other passengers died in a plane crash on approach to John Wayne Airport in Orange County, California. The charter aircraft they were on had been following a Boeing 757 in for landing, became caught in its wake turbulence, and crashed. The ensuing crash investigation led to the Federal Aviation Administration requirement for an adequate distance between heavy aircraft and following light aircraft to allow wake turbulence to diminish. Upon Rich Snyder's death in 1993, Guy Snyder assumed the presidency and continued the company's aggressive expansion until he died from an overdose of painkillers in 1999. He was president for six years, expanding In-N-Out from 83 to 140 locations. His mother Esther subsequently took over the presidency. In-N-Out Burger sign in Norwalk, California. The company opened locations in Arizona in 2000 and added new restaurants in Reno, Sparks, and Carson City, Nevada in late 2004. In-N-Out became a huge success in these new locations. In 2007, it opened its first restaurant in Tucson, Arizona. The store opening broke company records for the most burgers sold in one day and the most sold in one week. In 2008, In-N-Out expanded into a fourth state by opening a location in Washington, Utah, a suburb of St. George. By late 2009, the chain expanded into northern Utah with three new locations situated in Draper, American Fork, and Orem. More locations opened in the spring of 2010 in West Valley City, West Jordan, Centerville, and Riverton. In-N-Out Burger in Frisco, Texas, one of the first locations to open in Texas. 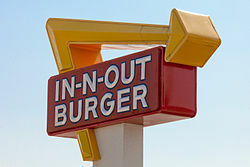 In May 2010, In-N-Out announced plans to open new spots into Texas, specifically within the Dallas–Fort Worth area with the first In-N-Out opening in Frisco and Allen on May 11, 2011. The chain opened its first location in Austin in December 2013. There are 21 restaurant locations in the Dallas–Fort Worth area, and four in the Austin area. These new locations in Texas required the company to build a new patty production facility and distribution center in the state, according to company vice president Carl Van Fleet. In March 2014, the company confirmed its first location in San Antonio. The fall of 2014 saw the restaurant open its 22nd Texas location in Killeen. On November 20, 2014, In-N-Out opened its first location in San Antonio followed by its first location in Waco in November 2015. In January 2017, In-N-Out announced plans to expand into Houston with multiple sites planned in the area, the first being in Stafford. In January 2015, In-N-Out opened its 300th restaurant, which was located in Anaheim, California. At the time of the opening, the company had generated $558 million in annual sales and employed nearly 18,000 in California, Nevada, Utah, Texas and Arizona. In-N-Out in Medford, Oregon, the first in the state. The company opened its first location in Oregon on September 9, 2015 (the same day as Harry Snyder's birthday) in Medford. It is supplied from the Lathrop, California distribution center that was completed in 2006. President Lynsi Snyder stated during the opening that they will continue to open new spots. A second Oregon location was under construction in Grants Pass during September 2017. On August 21, 2018, In-N-Out announced plans to open a location in the Willamette Valley in Keizer. This would be the company’s northernmost location. On November 30, 2017, the company announced plans to build a production facility and distribution center in Colorado Springs, ahead of an expansion into Colorado, which is scheduled to be completed in 2021. While the company grew, it didn't maintain its family roots. Esther Snyder died in 2006 at the age of 86 and passed the presidency to Mark Taylor, former vice president of operations. Taylor became the company's fifth president and first non-family member to hold the position, although he does have ties to the family. The company's current heiress is Lynsi Snyder, daughter of Guy and only grandchild of Esther and Harry Snyder. Snyder, who was 23 years old and known as Lynsi Martinez at her grandmother's death, owns the company through a trust. She gained control of 50% of the company in 2012 when she turned 30, and nearly full control at 35 in May 2017. After participating in various roles in the company, Snyder assumed the presidency in 2010, becoming the company's sixth president. However, most major decisions are made by a seven-member executive team. Snyder does not intend to franchise nor sell, and plans to pass on ownership of the company to her children. 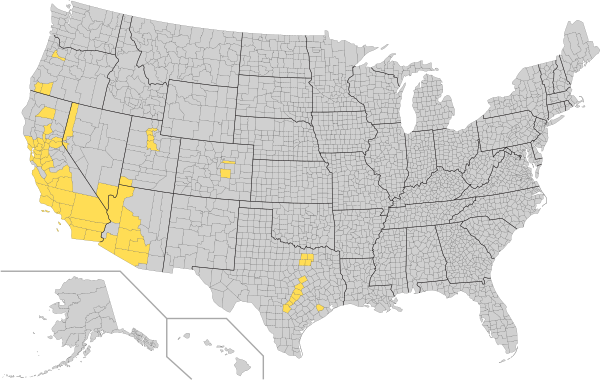 Counties with at least one In-N-Out location (as of September 2015). Since 1992, In-N-Out has expanded beyond California to Arizona, Nevada, Texas, Utah, and most recently Oregon. In 2006, a lawsuit exposed a possible family disagreement over the chain's corporate leadership. Richard Boyd, one of In-N-Out's vice presidents and co-trustee of two-thirds of the company stock, accused Lynsi Martinez and allied corporate executives of trying to force out Esther Snyder and attempting to fire Boyd unreasonably. Pre-empting the suit, Martinez, Snyder and Taylor appeared in a December video message to employees, telling them not to believe everything they hear. The company then responded with a lawsuit of its own, alleging Boyd had construction work done on his personal property and charged it to the company, as well as favoring contractors with uncompetitive bids. Boyd was then suspended from his role as co-trustee and Northern Trust Bank of California took his place (as co-trustee) until a hearing set for May 10, 2006. However, in April, the judge dismissed two of In-N-Out's claims against Boyd. A trial date of October 17, 2006, was set but never occurred, and a settlement was reached out of court. Ultimately, Boyd was permanently removed from his role as an employee and co-trustee. 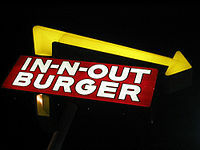 In June 2007, the company filed a lawsuit against an American Fork, Utah, restaurant named Chadder's for trademark infringement, claiming that the "look and feel" of the restaurant too closely resembled that of In-N-Out, and that the restaurant violated trademarked menu items, such as "Animal Style", "Protein Style", "Double-Double." The company was tipped off by Utah customers contacting the customer service department asking if In-N-Out opened a location in Utah under a different name or if they had any affiliation with the restaurant in any way. Several customers stated they ordered trademarked items such as Animal and Protein styles. Utah District court Judge Ted Stewart issued a temporary restraining order against the look-alike. Chadder's opened another location near the Salt Lake City area and one in Provo. In 2009, In-N-Out opened a restaurant in American Fork less than a mile from the Chadder's restaurant. Per their website, Chadder's started selling a "Stubby Double" instead of "Double Double". The Chadder's restaurants in Utah have gone out of business since In-N-Out restaurants have opened in Utah. On November 6, 2015, In-N-Out filed a lawsuit against food delivery startup, DoorDash, claiming trademark infringement. Two months later the lawsuit was dismissed after a confidential settlement. DoorDash no longer delivers food from In-N-Out Burger. On May 9, 2017, the In-N-Out Burger in Livermore, California, temporarily closed its doors after nine members of a college softball team reported getting sick after eating at that particular restaurant. The Alameda County Department of Environmental Health is investigating the incident and suspects norovirus was the cause of the illnesses, but will not be able to confirm the cause until laboratory tests are completed. The location had been cited for a "high risk" health code violation in December 2016, with minor citations for the same problem in April 2017. In-N-Out representatives said they had no indications of any issues at the location but have cleaned and disinfected it along with reviewing procedures with employees. On May 12, 2017, the Alameda County Department of Environmental Health reported that they now believe that the members of the college softball team may have already been infected with the virus prior to entering the Livermore restaurant. As a precaution, the DEH are continuing their laboratory tests on In-N-Out employees to conclusively rule them out as a possible source of the infection. The In-N-Out menu consists of three burger varieties: hamburger, cheeseburger, and "Double-Double" (two hamburger patties and two slices of cheese). French fries and fountain drinks are available, as well as three flavors of milkshakes. The hamburgers come with lettuce, tomato, with or without onions (the customer is asked upon ordering, and may have them fresh or grilled), and a sauce, which is called "spread" (a Thousand Island dressing variant). There are, however, additional named items not on the menu, but available at every In-N-Out. These variations reside on the chain's "secret menu", though the menu is accessible on the company's web site. These variations include 3×3 (which has three patties and three slices of cheese), 4×4 (four patties and four slices of cheese), Neapolitan shakes, grilled cheese sandwich (consists of the same ingredients as the burgers except the meat, plus two slices of melted cheese), Protein style (wrap with lettuce; consists of the same ingredients as the burgers except buns), and Animal Style (cooked in a thin layer of mustard, adding condiments including pickles, grilled onions, and extra spread). Animal Style fries come with two slices of melted cheese, spread, and grilled onions on top. Whole or sliced chili peppers are also available by request. Both Protein and Animal Style are house specialties that the company has trademarked because of their association with the chain. Until 2005 In-N-Out accommodated burger orders of any size by adding patties and slices of cheese at an additional cost. A particularly famous incident involving a 100×100 (100 patties, 100 slices of cheese) occurred in 2004. Once word got out of the massive sandwich, In-N-Out management disallowed anything larger than a 4×4. One can also order what is called a "Flying Dutchman" which consists of two meat patties and two slices of cheese by itself (no bun, condiments, or vegetables). In January 2018, In-N-Out added hot chocolate with marshmallows as its first addition to the menu in fifteen years. However, it is not the first time it has appeared on the menu; it was previously served at the restaurants in its early years during the 1950s. The cocoa powder is provided by the Ghirardelli Chocolate Company. In-N-Out restaurant in Pinole, California near Interstate 80 with one drive-thru lane and an indoor dining area. Note the crossed palm trees in the back. The first In-N-Outs had a common design, placing the kitchen "stand" between two lanes of cars. The "front" lane is nearest the street, and the "back" lane away from the street. This location design is known as a double drive thru. A metal awning provides shade for several tables for customers desiring to park and eat, but there is no indoor dining. A walk-up window faces the parking area. These restaurants store food and supplies in a separate building, and it is not uncommon for a driver to be asked to wait a moment while employees carry supplies to the kitchen across the rear lane. This design is a popular image on In-N-Out ads and artwork, which often shows classic cars such as 1965 Mustangs and 1968 Firebirds visiting the original restaurants. The original Covina restaurant, located on Arrow Highway west of Grand Avenue, was forced to close in the early 1990s due to re-engineering and development of the area. A modern design, drive-up/dining room restaurant was built a few hundred feet away. The replacement building was much larger, being nearly half the size of the previous building's lot. Like many chain restaurants, newer In-N-Out restaurants are based on a set of templates or "cookie-cutter" blueprints, which are chosen based on available space and expected traffic levels. While external appearance of its buildings may vary to meet local zoning and architectural requirements, the interior floor plan and decor in most recently constructed In-N-Out restaurants are identical. However, some restaurants are designed to stand out, such as the restaurants at Fisherman's Wharf, San Francisco and Westwood, Los Angeles. There are other design elements common among today's In-N-Out locations. Matching In-N-Out's California-inspired palm tree theme, palm trees are sometimes planted to form an "X" in front of the restaurants. This is an allusion to founder Harry Snyder's favorite movie, Stanley Kramer's It's a Mad, Mad, Mad, Mad World, in which the characters look for a hidden treasure and find it under "the big W" made by four palm trees, with the middle two forming an "X". 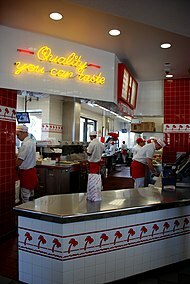 A typical interior with the company's motto, "Quality you can taste"
In-N-Out Burger sign in Los Angeles. Like other fast food chains, In-N-Out uses roadside billboards that attract customers to the nearest location. Billboard ads display an image of the trademarked Double-Double burger. The chain uses short radio commercials, often limited to the song, "In-N-Out, In-N-Out. That's what a hamburger's all about." Television commercials, which are less common, feature the hamburger's visual appeal. In-N-Out seldom uses celebrities in ads, although John Cleese and John Goodman have voiced radio spots. In the past, the Snyders also sponsored Christmas music programming with voice-overs expressing the meaning of the holiday. In addition to conventional, paid advertising, In-N-Out benefits from enthusiastic fans who talk to each other. 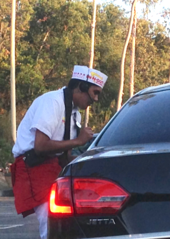 For many years, it has given customers free bumper stickers which simply say "In-N-Out Burger". The company helps devoted customers advertise its brand by selling souvenir clothing with the In-N-Out logo. Celebrity fans and free endorsements in mass media also promote the business. When Heisman Trophy winner and Ohio State quarterback Troy Smith raved about In-N-Out cheeseburgers during a press conference before the 2007 BCS National Championship Game, a senior executive said, "It does not get much better than that for us. We're kind of a small company, and we do not have any celebrity endorsers. But I think we just got the best one we could have." Huell Howser was allowed, in what is believed to be a first, to film with his television cameras inside a store for a California's Gold Special. The show also included a behind-the-scenes tour of the In-N-Out Headquarters. In-N-Out offers mobile catering in some Southern California markets. Mobile POS systems are used during peak hours to help curb long drive-thru lines. The restaurant has achieved popularity which has led to celebration by some when brought to new locations, and the opening of a new restaurant often becomes an event. When one opened in Scottsdale, Arizona, there was a four-hour wait for food, and news helicopters whirled above the parking lot. The chain's image has also made it popular in some unusual ways. For example, In-N-Out is still considered acceptable in some areas with a strong opposition to corporate food restaurants, such as McDonald's. Anyone with a business interest in San Francisco's Fisherman's Wharf district said they opposed every other fast food chain except In-N-Out, because they wanted to maintain the flavor of family-owned, decades-old businesses in the area, with one saying locals would ordinarily "be up in arms about a fast-food operation coming to Fisherman's Wharf," but "this is different." California native and Colorado Rockies player Jason Giambi would often visit In-N-Out Burger when on the West Coast with his former team, the New York Yankees. He said he tried to open an In-N-Out Burger restaurant in New York, but was unsuccessful. In-N-Out was one of the very few restaurant chains given a positive mention in the book Fast Food Nation. The book commended the chain for using natural and fresh ingredients and for looking after the interests of employees regarding pay and benefits. An In-N-Out food truck catered Vanity Fair's 2012 Academy Awards after party. Richard Bunkall painting commissioned by Haenel family of In-N-Out Burger. 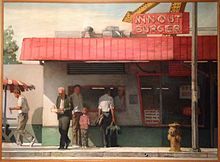 Jack Schmidt was the first person commissioned to paint the original In-N-Out located in Baldwin Park, California for In-N-Out Burger Inc. His paintings were later reproduced on advertisements, shirts, and other consumer products. In-N-Out prints Bible citations in small print on areas of packaging. This practice began in the 1980s during Rich Snyder's presidency, a reflection of the Christian beliefs held by the Snyder family. The In-N-Out Burgers Foundation, was established as a 501(c)(3) nonprofit organization in March 1995, and classified as a "Human Services: Fund Raising & Fund Distribution" organization under the NTEE system. Based in Irvine, California, the foundation "supports organizations that provide residential treatment, emergency shelter, foster care, and early intervention for children in need". Its grant-making activities are restricted to eligible nonprofit groups that are located or provide services in areas where In-N-Out has a presence. Consequently, grant proposals are only accepted from applicants in a limited number of counties in Arizona, California, Nevada, Utah, Texas. In 2010, the most recent year for which financial reporting is publicly available (and before the opening of the company's Texas locations), the foundation contributed $1,545,250 to 231 grantees in Arizona, California, Nevada, Utah. Grant-making is funded through donor contributions and In-N-Out-sponsored fundraisers; typical grants are between $2,000 and $20,000. In-N-Out Burger founded the Slave 2 Nothing Foundation in 2016 to "improve the lives of individuals and families affected by substance abuse and/or human trafficking." The first In-N-Out restaurant that opened in 1948 was demolished when Interstate 10 (then U.S. 60/70/99, the Ramona Freeway, now the San Bernardino Freeway) was built from downtown Los Angeles to the San Gabriel Valley. The freeway runs over the original location. 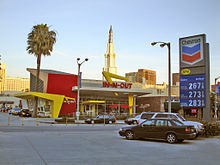 A new restaurant was completed in 1954 near the original Baldwin Park, California, location, but was closed in November 2004 and demolished on April 16, 2011 despite discussions about using it as an In-N-Out museum chronicling the origins and history of the company. In-N-Out built a replacement restaurant on the other side of the freeway next to the original In-N-Out University (opened in 1984). A new In-N-Out University was built on the property. 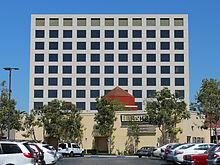 The University building houses the training department, which was moved from Irvine, California. In addition, the company restaurant was moved from In-N-Out's Baldwin Park headquarters to the new lot, which holds the restaurant and university, less than a thousand feet away. In 2014, a replica of the first In-N-Out was built in Baldwin Park. ^ "Restaurant Locations". In-N-Out Burger. Retrieved November 30, 2018. ^ "Phoenix Distribution Center". City Search. Retrieved May 12, 2011. ^ "In-N-Out Burgers plans more Utah locations". Enterprise Newspaper Group. Archived from the original on March 21, 2015. Retrieved May 12, 2011. ^ Robinson-Jacobs, Karen (October 7, 2010). "In-N-Out Burger plans up to 8 restaurants for DFW, major distribution center for Texas hub". The Dallas Morning News. Retrieved May 12, 2011. ^ a b c Schermerhorn, John R. (October 11, 2011). Exploring Management. John Wiley & Sons. p. C-36. Retrieved May 19, 2012 – via Google Books. ^ "Restaurant Employment". In-N-Out Burger. ^ a b Pomfre, John (January 30, 2006). "In Calif., Internal Lawsuits Served Up at Burger Chain". The Washington Post. Retrieved August 6, 2006. ^ a b c Bronstad, Amanda (December 5, 2005). "In-n-Out burned by exec's lawsuit". Los Angeles Business Journal. AllBusiness.com. Archived from the original on May 21, 2009. Retrieved August 6, 2006. ^ a b Strasburg, Jenny (March 3, 2001). "In-N-Out Burger Beefs Up the Wharf Chain's followers now have S.F. site". The San Francisco Gate. Retrieved August 6, 2006. ^ Flandez, Raymund (January 28, 2009). "In-N-Out Burger vs. McDonald's: Guess Who Won?". The Wall Street Journal. ^ "Zagat Surveys Nation's Fast Food". Zagat.com. June 8, 2009. Archived from the original on December 7, 2010. ^ Pellegrini, Frank (August 31, 2000). "Restaurant Review: The In-N-Out Burger". Time. Retrieved November 1, 2008. ^ "History of In and Out Burger". FundingUniverse. ^ "Marketplace: What sets burger chain In-N-Out apart". Marketplace (radio program). May 7, 2009. Archived from the original on July 27, 2011. ^ "Esther Snyder, In-N-Out Burger Founder, Dies at 86". The New York Times. August 13, 2006. Retrieved April 4, 2008. ^ a b "History". In-N-Out. Retrieved November 1, 2008. ^ "Carson City In-N-Out Burger Construction Photos". Around Carson. October 14, 2004. ^ Pangburn, Joe (June 15, 2007). "In-N-Out Burger's all-stars set record with Tucson opening". Inside Tucson Business. ^ Hancock, Jacob (February 14, 2009). "Famous IN-N-OUT coming to Draper". Deseret News. ^ Garnett, Ricky (February 19, 2009). "In-N-Out coming to American Fork". Secret Menus. ^ "2 In-N-Out Burger locations open in Utah". KSL-TV. November 19, 2009. ^ Rigert, Michael (November 20, 2009). "In-N-Out fans come out en masse for Orem opening". Provo Daily Herald. ^ a b Sanchez, Jennifer W. (July 20, 2010). "Two new In-N-Out Burgers opening up". Salt Lake Tribune. ^ Kavner, Lucas (July 12, 2012). "In-N-Out Burger Expands To North Texas, People Line Up (UPDATE)". Huffington Post. Retrieved January 26, 2013. ^ Wood, Virginia B. (December 9, 2013). "In-N-Out Burger Comes to Our 'Hood: 65-year-old California burger chain opens in Austin Thursday Dec. 12". Austin Chronicle. ^ Brion, Raphael (March 14, 2011). "In-N-Out's New Dallas Distribution Center Means it Could Expand to Thirteen States". Eater. ^ Sterling, Colin (May 27, 2010). "In-N-Out Burger Heads To Dallas, Texas". The Huffington Post. Retrieved June 1, 2010. ^ Morton, Neal (March 20, 2014). "In-N-Out confirms first S.A. site". My San Antonio. Retrieved March 20, 2014. ^ Stewart, Natalie (October 8, 2014). "Californians line up for In-N-Out opening in Killeen". Killian Daily Herald. ^ Morton, Neal (November 19, 2014). "San Antonio's first In-N-Out Burger opening Thursday". San Antonio Express-News. ^ Griffin, Taylor (August 23, 2015). "New eats in Waco coming this fall". Baylor Lariat. ^ Adams, Madison (November 20, 2015). "Waco: In-N-Out Burger Opens Then Closes, But Just Temporarily". KWTX-TV. Archived from the original on June 2, 2016. ^ Brock, James (January 31, 2017). "Whataburger, Beware! In-N-Out Burger Reportedly Close To Land Deals in Houston: California-based chain would join imports Shake Shack, Hopdoddy, and others in the Bayou City". Patch Media. ^ "In-N-Out Burger to bring 'animal style' to the Bayou City". KTRK-TV. February 1, 2017. ^ Luna, Nancy (January 7, 2015). "In-N-Out hits milestone with 300th store". Orange County Register. ^ Bakall, Samantha (September 9, 2015). "Waiting in line at In-N-Out's first Oregon restaurant in Medford". The Oregonian. ^ "G.P. In-N-Out location won't feature iconic palm trees". KOBI. September 13, 2017. ^ Singer, Matthew (August 21, 2018). "In-N-Out Burger Is Opening a Location Just 45 Minutes from Portland". Willamette Week. ^ Alter, Aaron (August 22, 2018). "In-N-Out Burger set to open near Portland". SFGate. ^ Harden, Sealover, Mark, Ed (November 30, 2017). "In-N-Out Burger is coming to Colorado". Denver Business Journal. ^ Reedy, Allyson (December 8, 2017). "In-N-Out watch: It could be three years before Colorado's first location opens". The Denver Post. Retrieved April 6, 2018. ^ Lubove, Seth (February 7, 2013). "Lynsi Torres, In-N-Out Burger's Elusive Billionaire". Bloomberg BusinessWeek. Retrieved February 9, 2013. ^ Clough, Richard (February 22, 2013). "Drag-racing heiress keeps In-N-Out on course". Orange County Register. ^ "In-N-Out Road Trip Location Guide" (PDF). In-N-Out. May 22, 2014. Retrieved May 25, 2014. ^ Luna, Nancy (April 6, 2006). "In-N-Out ordered to alter some claims in lawsuit". Orange County Register. ^ "In-N-Out, former VP reach secretive settlement". TMC News. August 6, 2006. ^ a b Van Leer, Twila (June 30, 2007). "In-N-Out wins one over Chadders". Deseret News. ^ Butterfield, Amanda (June 18, 2007). "In-N-Out Burger sues American Fork Restaurant". KSL-TV. ^ "In-N-Out coming to American Fork". Daily Herald (Utah). February 19, 2009. Archived from the original on April 26, 2009. ^ "In-N-Out Burger Suing American Fork Burger Joint". Fox News. June 19, 2007. ^ Hancock, Laura (May 14, 2010). "Chadder's Sued For Not Opening". Deseret News. ^ Channick, Robert. "Suburban restaurant in DoorDash lawsuit: Stop delivering our food". chicagotribune.com. ^ Sernoffsky, Evan (May 10, 2017). "Livermore In-N-Out Burger temporarily closes after diners sickened". San Francisco Chronicle. ^ Nguyen, Chris (May 10, 2017). "Livermore In-N-Out Burger voluntarily closes after customers reportedly got sick". KGO-TV. ^ Cestone, Vince (May 10, 2017). "VIDEO: Livermore In-N-Out Burger temporarily closed after group of customers complain of flu-like symptoms". KRON-TV. ^ Cestone, Vince (May 12, 2017). "Health Officials: Group of customers did not get sickened at Livermore In-N-Out, restaurant reopens". KRON-TV. ^ "Not So Secret Menu". In-N-Out Burger. Retrieved November 7, 2017. ^ "A 100x100 at In-N-Out". Super Sized Meals. January 25, 2006. ^ Pollack, Neal (July 23, 2009). "Welcome to Burger Heaven". Maxim. Archived from the original on July 25, 2009. ^ Marcotte, John (February 25, 2005). "In-N-Out's Secret Menu". Badmouth. ^ Filloon, Whitney (January 3, 2018). "In-N-Out Has Added Hot Cocoa to Its Menu". Eater. ^ Luna, Nancy (January 3, 2018). "In-N-Out adds Ghirardelli hot cocoa, the first new menu item in more than a decade". The Orange County Register. Retrieved April 23, 2018. Company president Lynsi Snyder, whose grandparents founded In-N-Out in 1948, said hot cocoa was previously sold at the chain in the 1950s. "This is actually the return of hot cocoa", she said in a statement. "My grandparents, Harry and Esther Snyder, served it for many years beginning in the '50s. I'm not sure how it fell off the menu but it's part of our culture and something special for kids, and I'm happy that we're bringing it back." She said the company sources cocoa powder from Ghirardelli Chocolate Company to make the hot chocolate. ^ a b Savio, Kelly (August 9, 2006). "The Ins and Outs of In-N-Out". Gilroy Dispatch. Archived from the original on September 27, 2007. ^ Perman, Stacy (2010). In-N-Out Burger: A Behind-the-Counter Look at the Fast-Food Chain That Breaks All the Rules. Harper Collins. pp. 149–50. ISBN 9780061872143. ^ Pellegrini, Frank (August 21, 2000). "Restaurant Review: The In-N-Out Burger". Time. Retrieved January 10, 2010. ^ Briggs, David (January 8, 2007). "Smith Stays In, Buckeyes Worth Big Bucks". The Lantern. Archived from the original on June 7, 2011. Retrieved January 10, 2010. ^ Howser, Huell (2009). "California's Gold #146 - IN-N-OUT BURGER". California's Gold. Episode 146. PBS. KCET. Archived from the original on January 6, 2014. Retrieved January 5, 2014. ^ McNichol, Tom (August 14, 2002). "The Secret Behind A Burger Cult". The New York Times. Retrieved July 21, 2007. ^ Olney, Buster (January 6, 2009). "Jason Giambi, Oakland Athletics on verge of one-year deal". ESPN. ^ a b Scott, Jill (April 20, 2008). "Gordon Ramsay admits secret passion for fast food burgers". Daily Record (Scotland). ^ a b c Luna, Nancy (March 2011). "Attack of the Double Double". D Magazine. Archived from the original on May 17, 2011. Retrieved March 1, 2011. ^ Stein, Joshua David (April 13, 2010). "Thomas Keller: His fantasy burger restaurant". Eater. Retrieved April 13, 2010. ^ Parsons, Russ (August 7, 2002). "A day in the life at 90". Los Angeles Times. Retrieved August 7, 2002. ^ Franklin, Marcy (January 13, 2015). "Anthony Bourdain: Unofficial Spokesperson for In-N-Out Burger". The Braiser. Abrams Media Network. Retrieved January 13, 2015. ^ DeJesus, Erin (January 8, 2015). "Watch Anthony Bourdain Extoll the Virtues of In-N-Out Burger". Eater. Vox Media. Retrieved January 13, 2015. ^ Boscamp, Emi (December 18, 2017). "Ina Garten's biggest holiday blunder & more things you didn't know about her". TODAY.com/Food. NBC News Media. Retrieved December 18, 2017. ^ Schlosser, Eric (2002). Fast Food Nation. HarperCollins. p. 259. ISBN 0-06-093845-5. ^ "Child Abuse Foundation: History". In-N-Out Burger. Retrieved September 12, 2012. ^ "In-N-Out Burgers Foundation". National Center for Charitable Statistics. Archived from the original on January 14, 2013. Retrieved September 12, 2012. ^ "Child Abuse Foundation: Eligibility". In-N-Out Burger. Retrieved September 12, 2012. ^ a b "Child Abuse Foundation: About The Grants". In-N-Out Burger. Retrieved September 12, 2012. ^ Luna, Nancy (May 5, 2011). "In-N-Out Burger: 2 Texas restaurants to open next week". OC Register. Archived from the original on October 20, 2013. Retrieved September 12, 2012. ^ "About Us - Slave 2 Nothing". ^ Self, Zac (October 16, 2018). "In-N-Out Burger gets its own day in San Diego". ABC 10 News. Retrieved January 18, 2019. ^ Pool, Bob & Kim, Victoria (April 16, 2011). "Historic In-N-Out Burger stand is Down-N-Out". Los Angeles Times. Retrieved August 10, 2013. ^ Luna, Nancy (February 26, 2014). "SoCal institution In-N-Out opens replica 1948 burger stand". OC Register. Retrieved August 7, 2015. Hawn, Carleen (August 7, 2006). "In-N-Out Burger is giving McDonald's a run for its money". fastcompany.com. Perman, Stacy (2009). In-N-Out Burger: A Behind-the-Counter Look at the Fast-Food Chain That Breaks All the Rules. New York: HarperBusiness. ISBN 978-0-06-134671-2. Archived from the original on December 1, 2010. Wikimedia Commons has media related to In-N-Out Burger. The In-N-Out Burger Opening Day Phenomenon!